You can arrange transportation for your entire wedding party to the venue or reception. Or, you could even hold the reception ON the bus itself! Keep in mind that these are no ordinary buses: these are luxury models that are just as sleek as limousines. They can hold up to 50 people, depending on the model. Even with a lot of people, there is still enough room for everybody to stretch out. If a limo bus is a good choice for a wedding celebration, it’s also a good choice for Bachelor and Bachelorette parties. With features like bright, colourful lights, a wet bar, and dance floor, you couldn’t ask for more! The prom is the most important event for high school students. It can be a spectacular event that’s second to only a wedding. While many couples do book traditional limos on prom night, a party bus is a great choice for large groups of friends. Get together with all of your friends on a bus and spend some time going around the city before arriving at the big event. Whether it’s your own birthday or someone else’s, you can enjoy the big day in style with mobile entertainment. You can arrange for decorations and amenities that suit a specific theme. Let the limo company know the age and tastes of the person you’re throwing the party for and they will make accommodations accordingly. Whether you’re part of a team or a loyal fan of a team, get to your sporting events in style. Party limo busses can also be used for celebrations and rewarding a team with a victory party. If you’re a fan and want to go see a big game or match, bring your friends along with you. This is also a great way for family and friends of the players to travel to games. Who says corporate events can’t be mobile? If your company has seen a lot of success, it’s time to celebrate. Corporations don’t always have to be all work and no play. You can also use the party bus to pick up clients and show them around the city. If you do need to do some work, ask the limo bus rental company if you can have office equipment set up. 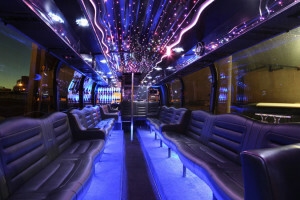 These are just a few ideas of the types of celebrations you can have by hiring a party limo bus in Toronto. Before you book, know the date, times, and the estimated number of people who will be on the bus so that you can get the most accurate quote possible. Be sure to look at pictures of the available buses for an idea of how stylish they can be. Only rent from a company that does a good job of keeping its vehicles clean and serviced. A great place to start is Majestic Limos!